Combine soy sauce and gelatin in small bowl. Set aside to allow gelatin to bloom, about 5 minutes. Microwave ½ cup water and mushrooms in covered bowl until steaming, about 1 minutes. Let stand until softened, about 5 minutes. Drain mushrooms in fine mesh strainer lined with coffee filter, discard liquid and chop mushrooms finely. Place half of pork in food processor and pulse until coarsely ground into approximately 1/8 inch pieces, about 10 pulses; transfer to large bowl. Add shrimp and remaining pork to food processor and pulse until coarsely chopped into approximately ¼ inch pieces, about 5 pulses. Transfer to bowl with more finely ground pork. Stir in soy sauce mixture, mushrooms, water chestnuts, cornstarch, cilantro, sesame oil, wine, vinegar, sugar, ginger, salt, and pepper. Divide wrappers into 3 stacks. Using 3 inch biscuit cutter, cut two 3 inch rounds from each stack of wrappers(you should have 40 to 42 rounds). Cover rounds with moist paper towels. Working with 6 rounds at a time, brush edges of each round lightly with water. Place heaping tablespoon of filling in center of each round, then form dumplings, crimping wrapper around sides of filling and leaving top exposed. Transfer to parchment paper lined baking sheet, cover with damp kitchen towel, and repeat with remaining wrappers and filling. Top center of each dumpling with pinch grated carrot, if using. Cut parchment slightly smaller than diameter of steamer basket and place in basket. Poke 20 small holes in parchment and lightly coat with vegetable oil spray. Place in basket poke 20 small holes in parchment and lightly coat with vegetable oil spray. Place batches of dumpling on parchment liner, making sure they are not touching. Set steamer over simmering water and cook, covered, until no longer pink, 8 to 10 minutes. Serve immediately with chili oil. 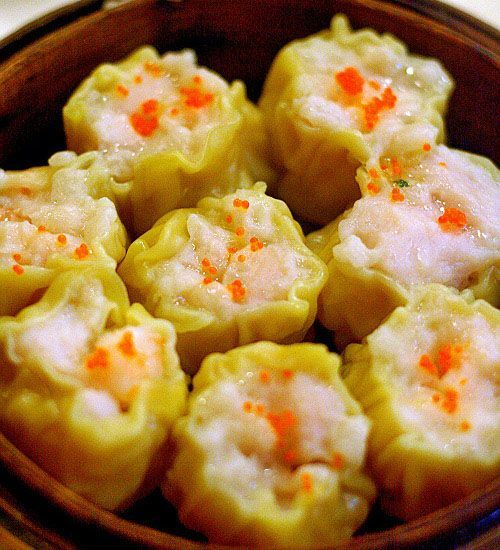 (dumplings may be frozen for up to 3 months; if frozen, cook as directed for 13 to 15 minutes. Combine soy sauce, sugar, and salt in bowl; set aside. Heat oil in saucepan over medium heat until just shimmering and it registers 300 degrees. Remove pan from heat and stir in pepper flakes, garlic, soy sauce mixture. Let cool to room temperature, stirring occasionally, about 1 hour. Discard garlic before serving. End.